How do you encompass all the worlds of the imagination? Within fantasy’s scope lies every possible impossibility, from deagons to spirits, from magic to gods, and from the unliving to the undying. In Fearsome Journeys, master anthologist Jonathan Strahan sets out on a quest to find the very limits of the unlimited, collecting twelve brand new stories by some of the most popular and exciting names in epic fantasy from around the world. 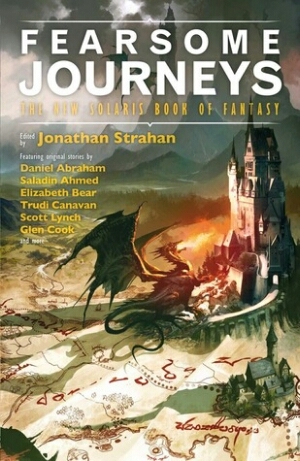 Fearsome Journeys is subtitled as the New Solaris Book of Fantasy; Jonathan Strahan has collected some of the most storied names in fantasy together and taken short stories from them, all under the broad rubric of “epic fantasy”. Unfortunately, Strahan’s model of epic fantasy is quite a narrow one here; while all the stories have differences in tone, they all fall under a broadly swords-and-sorcery model, set in secondary worlds, but without messing with the same basic formula. On the positive side, though, they come from a variety of authors; half the contributors to this anthology are women, although only one is a person of colour. That shows in the stories contributed to Fearsome Journeys; they are a lot better than much epic fantasy at ensuring they feature rounded, interesting female characters treated on the same level as the male characters, some stories centred on women and some on men. This is most clear in Kate Elliott’s ‘Leaf and Branch and Grass and Vine’, an amazing story whose protagonist is a widow with grown children, which avoids the standard violent solutions of epic fantasy in favour of politics, frienships and humanity. It’s a quiet little story but also a wide-ranging one, about heirarchies, status, power and how power can be used; an absolutely outstanding contribution to the collection. Similarly, Ellen Klages’ ‘Sponda the Suet Girl and the Secret of the French Pearl’ focuses its attentions on a would-be thief and a tavern-running young woman. The former is not a hero, but rather a clumsy protagonist, while the latter, and her girlfriend, are what this story treats as heroes; not necessarily heroic per se, but at least heroised. The story is somewhere between a shaggy dog tale and a heist caper turned around on the would-be heister; Klages manages the characters well, and keeps her tricks concealed until she deploys them at exactly the right moment. Klages gets the beats exactly right to keep this a light and humourous story; the occasionally lewd humour is funny and well played, and doesn’t remove the fact that there are some interesting sociopolitical discussions going on in this little piece. At the other end of the spectrum is Daniel Abraham’s ‘High King Dreaming’; this really is traditional fate-of-nations epic fantasy fare, but at the same time, it has an intelligent and brilliant twist. The High King of the title is Arthurian in status, having united a nation and having been prophesied to return in that nation’s time of greatest need; the story is told from the point of his death, as we watch him watching his funeral. Abraham plays with time, moving backwards and forwards to create a story that is about the demands on a ruler, the imperatives on a parent, and the compromises required by politics; he is unsubtle in talking about big themes and large ideas, in interesting ways. Unfortunately, this isn’t an entirely strong collection. ‘Spirits of Salt: Tales of the Coral Heart’ isn’t one of Jeffrey Ford’s stronger stories; it’s long, slow, and fails to really get anywhere, while trying to be about power and violence. Instead, the story meanders, without any meaningful characters or resolution; it’s frustrating and drawn out, to the point that the reader is frustrated and thrown out of the story. The ideas behind the story could be quite well-written but turn out to actually be glib and trite, with the attempted twists oversimplified. Similarly, Saladin Ahmed’s ‘Amethyst, Shadow and Light’ has a lot of potential, and some fascinating elements in terms of character interaction, but in the end is a predictable story that fails to really engage with its subject-matter; the morality is simplistic and the approach to plot incredibly straightforward. Fearsome Journeys is a fascinating snapshot of epic fantasy today; it avoids the worst of the worst, the excesses and incredible length of Brandon Sanderson and the racism of Peter V Brett, but does have a mix of the serious and the humourous, the small scale and the grand, the well-written and the poorly accomplished. Jonathan Strahan is an excellent anthologist, and Fearsome Journeys is one of the better anthologies out there; almost entirely strong, moderately diverse, and worth reading. By Intellectus_Speculativus in Review on April 13, 2015 .